The Heirloom Roses design I do is full of pink and white Geraldine Roses with green leaves and stems. It’s very popular, I couldn’t even begin to count how many sinks I’ve decorated with this pattern in many different variations, lots!!! 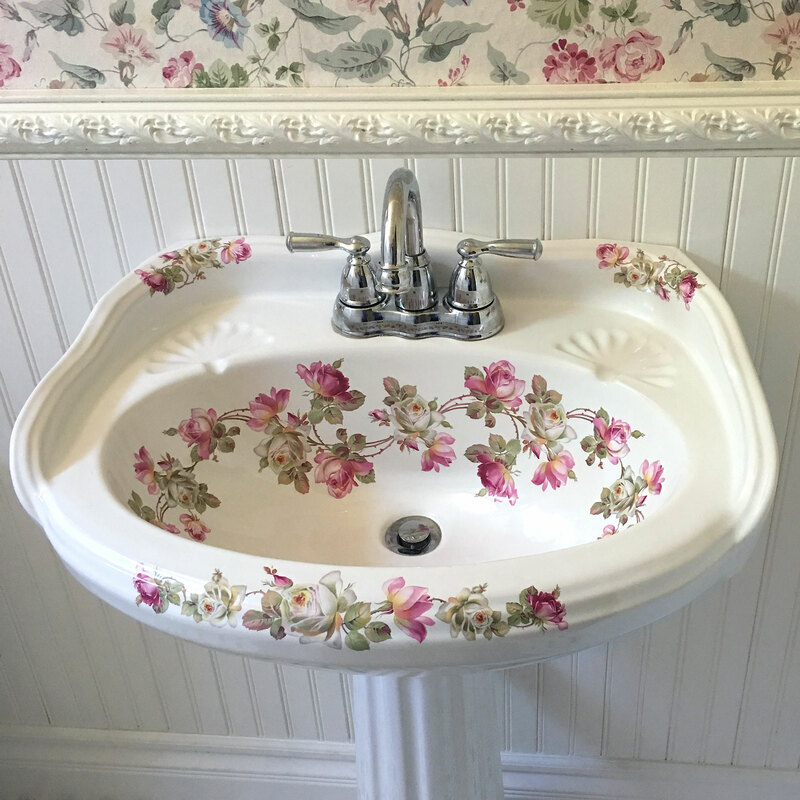 This post features just some of the many incarnations of the Heirloom Roses painted sinks I’ve done in some customer’s bathrooms. They are just some of the painted sinks we offer for sale on our website, decoratedbathroom.com. Please check them out. 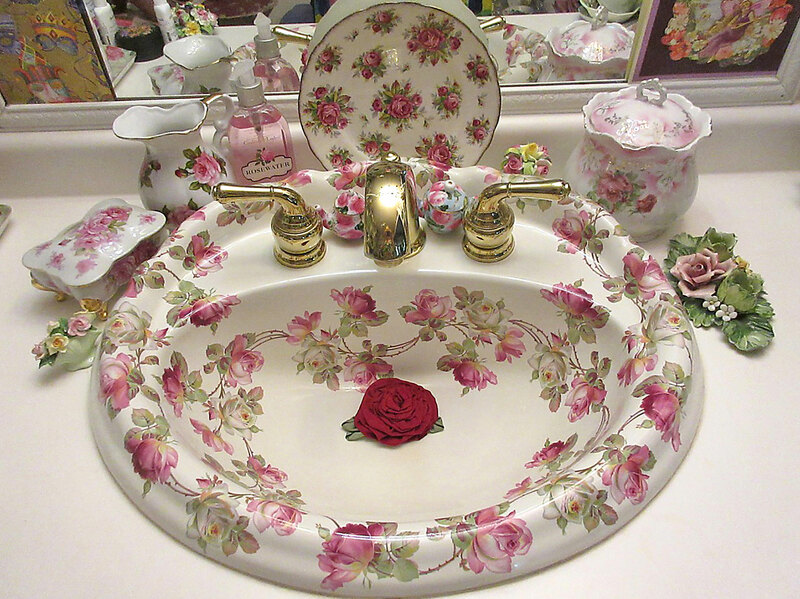 Pink Roses all over the bathroom and painted on the sink. I made this quite a while ago so it’s been in there for several years and you can see how it still looks perfect. The sink is a nice drop-in with a raised edge on it that unfortunately American Standard no longer makes. Bathroom design is going very modern at the moment and lots of the decorative sinks are being discontinued. Terrible for me because many of them really worked well with our selection of painted bathroom sinks and toilets. Did I mention toilets? I’ve done tons of them in this design too, you can check out a few on our website here. Toilets. I don’t mind. I do sometimes have to force myself to get the last few flowers on the sinks, ok more than sometimes, but it’s always a great feeling when I get one finished and can admire my creation. Then it has to dry for at least 24 hours to make sure there isn’t any moisture left under the decals. Then I check it over with two pairs of glasses on, it’s a great look, to make sure every little detail is perfect and there are no air bubbles. They blow up in the kiln and can mess up a sink pretty bad. Fortunately I am a gifted toucher-upper so I can usually rescue them with some creative china painting and another trip into the kiln. Pink Heirloom Roses on a Victorian style pedestal sink. This is another one of those old-fashioned sinks that they are no longer making. It was a St Thomas Arlington pedestal and they came in three sizes and were really great sinks. I’ve been having serious trouble getting small pedestal sinks lately that are good, I’ve ordered several and they came with curved pedestal legs and stuff and they had to be returned. I work very hard to obtain only perfect fixtures to use in the designs for our painted sinks and toilets. I really like the batten board on the wall, over-sized baseboards and decorative molding. Of course the sink looks fantastic too. It was an old house and they renovated the bathroom. I have a new sink that is almost the same style I am doing them on now, they are the Vicki by Barclay Products, weirdly made in the United Arab Emirates, which isn’t china, but since there is a lot of desert there, probably pretty good for sink manufacturing and production. 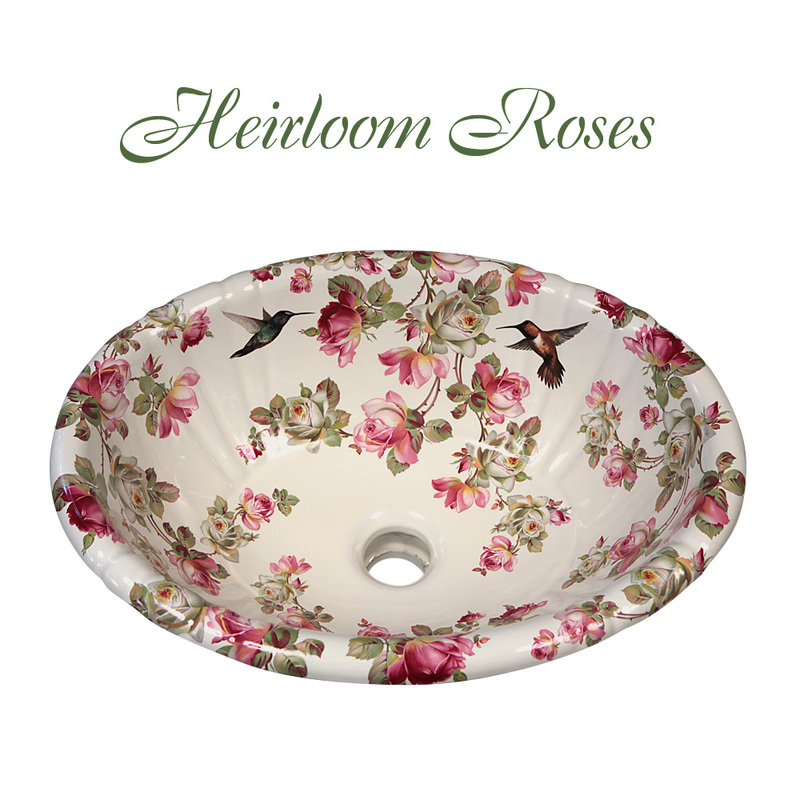 Get more information on the Heirloom Roses Painted Pedestal Lavatory here. I just recently made this one for a customer in Canada. Since I’m from there, I am always happy to go the extra mile and ship them to Canada. It costs more and I have to fill out a whole bunch more paperwork and you never know exactly what they are going to charge you for customs. There are loads of calculators on the internet, but it moves with the exchange rate and it takes me a few weeks to get a sink made and it can change. The customer didn’t want to change anything else in the bathroom except to replace an old sink. She sent me the size of the whole and we determined that this sink, the Kohler Pennington drop-in would fit. It did, no counter cutting required. Partly because the sink has a large rim on it so there is lots of leeway with hole size in the counter. Since it’s a drop-in basin and the rim covers the counter, if you have to modify it a bit, it doesn’t have to be pretty. I like the way the faucets match the hummingbirds, they really stand out that way. I just added it to the website, you can check it out here. 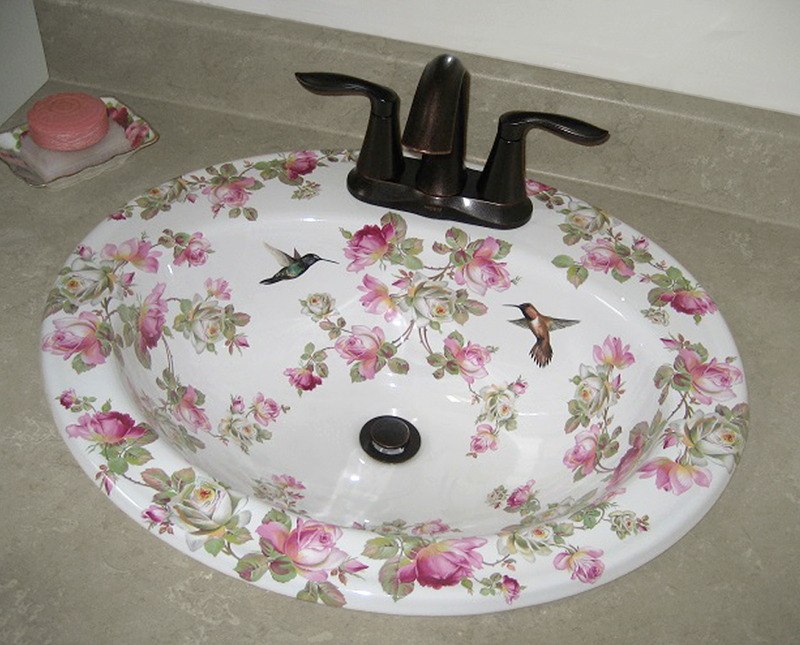 Heirloom Roses Painted Drop-in Bathroom Sink.